Q* Bert's Qubes 1984 By: Parker Bros.
Take several rows of suspended "three-dimensional" qubes that rotate in space. Drop onto them some very weird creatures in pursuit of a guy with a nose for tumbling those qubes to various colors, and what have you got? You've got one of the wackiest games you may ever play! And a most challenging one. You may need to match two or even three rows of qubes in one round. And then there is always someone -- or some thing -- trying to stop you... not to mention undo what you've always done. It's great fun, too. When was the last time you met a Meltnik or a Shoobop? --From the Colecovision Q* Bert's Qubes instruction manual. 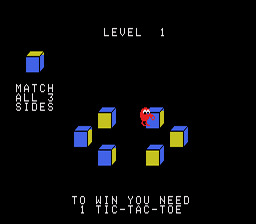 Play Q* Bert's Qubes Now!